It’s that time of year again – the Black Diamond Poker Open (BDPO) is about to begin at Ignition, Bovada, Bodog, and the other sites on the PaiWangLuo Poker Network. Running from March 1 through March 31, it promises to pay out at least $4 million in prizes across 139 numbered events. This is a considerable bump up from the $2.7 million in guarantees featured in the 2018 installment of the series. 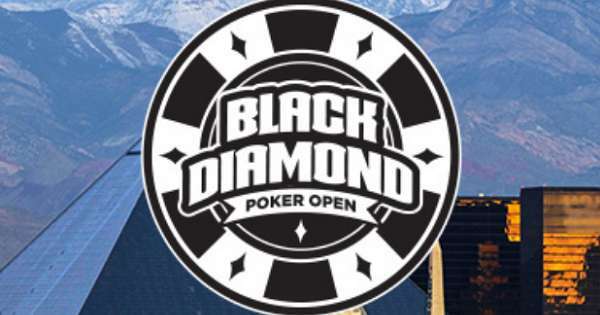 The buyins for the 2019 Black Diamond Poker Open start at $25 + $2.50 and reach as high as $425 + $25. Most of the 139 MTTs are No Limit Hold’em affairs, but within this broad category, there are instances of monster stack events that begin 750bb deep, knockout bounty tourneys, 6-max MTTs, and many other variations of standard NLHE gameplay. In addition, a smattering of Pot Limit Omaha, PLO/8, Limit O8, and Limit Hold’em contests round out the schedule. This is the eighth edition of the Black Diamond series, and therefore, all tournaments begin at either 8 minutes or 38 minutes past the hour. There are four BDPO competitions every weekday, five on Saturdays, and six each Sunday during the month of March. The first game every day begins at 7:38 a.m. ET. However, the bosses at the poker site realize that this is way too early in the morning for most poker players. Therefore, all other events begin either in the afternoon or evening. Not just one but FOUR separate tournaments, these High Roller specials provide the highest guarantees in the BDPO apart from the Main Event itself. Designed for the rich (in spirit if not in bankroll), they’re great if you enjoy the chance of winning substantial dough without having to battle all day long through fields of hundreds. Forget about nine-handed or six-max play; the true test of a champ is the ability to go one-on-one against a series of opponents and emerge victorious. Here you get to test your mettle in heads-up poker. You’ll have to play wide ranges and be willing to get to showdown light or risk being run over by your more aggressive adversaries. Remember to register on time for this one because there’s no late reg permitted. This is the largest guaranteed four-card poker installment in the 2019 BDPO. Six-handed tables and turbo blinds should keep the action moving at a fast pace, and the fact that there’s a $25 bounty on the head of every participant should incentivize putting chips in the pot too. Whether you win or lose, this is bound to be an entertaining tournament. Let’s face it – Limit Texas Hold’em was once the undisputed king of poker games, but it has fallen much from its former glory. It can be challenging to find this type of card game online particularly in tournament form. Yet, the PWL poker network does have LHE in the offing for the Black Diamond series, so get ready for some min-bet fun! Ideal for those who don’t wish to spring for the $450 entry to the Main Event, this event offers $88K to contend for and a buyin of just $100 + $9. If you do intend to join the Main Event, then you can treat the Mini Main as a warm-up: It begins just two hours before the highlight MTT of the series. With any luck, you’ll cash in both of them, which is a fine way to finish off your Black Diamond experience. The culmination of the festivities, the Main Event of the Black Diamond Poker Open will pay out a whopping $300,000 to the victors. This tourney boasts a modified payout structure whereby at least 20% of the field will walk away with a prize. Competitors start out with 750bb stacks, leading to deep play and hopefully giving you a lot of time at the tables even if you wind up busting out before the money. Although they’re not numbered events on the Black Diamond roster, the weekly $100,000 guaranteed MTTs that run every Sunday will see a few upgrades during March. The price stays the same ($150 + $12), but the guarantees will be slightly increased from the usual $100K to $108K. At the same time, the starting stacks will grow to 12,000 chips, providing you with more play for your buyin. There are those who prefer to earn their seats for a minimal investment rather than paying full list price for their tournaments. This group of individuals will appreciate the satellites to BDPO tourneys that have already started to appear in the lobby. You can use any tickets you earn for $25 + $2.50 or $50 + $5 BDPO events to join the appropriately priced BDPO Main Event satties, effectively creating your own step satellite path. Besides the multi-table qualifiers, there are also a few six-handed sit n’ gos that award BDPO seats. They cost $20+$2, $55 + $5, and $75 + $7 to enter, and they pay out in $109 BDPO Event, $325 High Roller Event, and $450 Main Event tickets respectively. If you neglect to win your Main Event seat in advance, there are $75 + $7 Last Chance qualifiers that let you attempt to snipe a last-minute entry. However, we recommend endeavoring to pick your seat up earlier than this so that you don’t run the risk of missing out on the event. You can win entry to any event only a single time; additional seats you win to the same tournament will be forfeited and cannot be exchanged for cash. This isn't as bad as it might seem because most of the tickets awarded are good for any BDPO tournament of the given price level, so you'll have some choice as to which events to play. If you've been procrastinating opening your account at the PWL Network, then it's time to stop delaying. It's the busiest online poker destination for American and Australian players, so you're missing out on a large number of pretty soft games by avoiding it. We advise our readers from the U.S.A. and the Land Down Under to register at Ignition Poker where you can get a 100% up to $1,000 poker bonus and a similarly sized bonus for casino games. Read our Ignition Casino Poker review for all the details. However, Americans who like to bet on sports as well as play cards might do better to sign up at Bovada, which has a sportsbook too, even though the Bovada poker bonus only goes up to $500. Our Bovada review page contains all the information you need. Canadians and residents of selected Latin American countries have a wonderful option in Bodog, and they can claim a 100% up to $1,000 bonus for the poker games. Browse over to our Bodog Poker review for instructions on how to create an account. Finally, Bodog88 is a possibility for those in Australia, China, Vietnam, and several other Asian markets. It also welcomes new customers with a 100% up to $1,000 poker deal. Head over to our thorough Bodog88 review page to learn more about this site.